(Geneva) The United Nations Committee on the Rights of the Child (CRC) expressed yesterday serious concerns about the spate of increasing commercialization of education in Ghana. The CRC was meeting in Geneva with representatives of the Government of Ghana to review the implementation of the Convention on the Rights of the Child by Ghana. Ms Amal Aldoseri, the vice-chair of the CRC, denounced the growth of private schools in Ghana which “creates segregation between children of poor and rich families, which worsens existing disparities in Ghanaian communities”. Other members of the Committee also insisted that many of the private schools “are in poor conditions” and employ untrained teachers. The chairperson of the CRC, Benyam Mezmur asked Ghana to explain how the situation has been evolving during the last five years, during which the proportion of private schools in Ghana has grown quickly. Nevertheless, the Ghanaian delegation, headed by the Minister for Gender, Children and Social Protection, Nana Oye Lithur, responded by admitting that private provision is filling a gap created by inadequate supply by the Government and that the Government encouraged and supported private schools with resources and infrastructure. Rather than acknowledging issues with the role and monitoring of the private sector in education, the Ghanaian government suggested it would be working even more with private schools. The Ghanaian delegation responded by noting that “private schools do not want to provide data because they do not want government to know what they are doing and that they may over-charge.” He also pledged that the authorities were working on improving the situation, without however giving any concrete timeline. 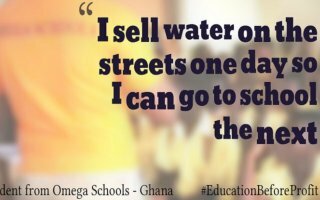 Surprisingly, the Ghanaian Government also denied any knowledge of Omega Schools, a chain of private for-profit schools targeting poor people, which the CRC pointed to as one of the most striking examples of the commercialisation of education which is threatening children’s rights in Ghana. This is despite the fact that Omega Schools teaches over 20,000 pupils in 38 schools, and is highly scrutinised since it received support from multinational corporations such as Pearson and Google.org, as well as a controversial grant from the British development aid agency, DFID. “The unwillingness on the part of the Government to fully acknowledge the rapid growth and commercialisation of basic education by private entrepreneurs, who in some cases are multinational corporations, is a huge indictment on government’s fulfilment of its obligation to protect the right of every child to enjoy free quality basic education”. GNECC, together with the Global Initiative for Economic, Social and Cultural Rights, have published two reports, in August 2014 and in May 2015, critically assessing the privatisation in education that is taking place in Ghana in the light of human rights standards. The organisations have recommended to the government target more investments towards public education so as to improve its quality, adequately monitor the development of private education and its impact on the realisation of the right to education, and effectively regulate private schools to ensure that they meet minimum standard of education delivery. The Committee on the Rights of the Child (CRC) is the body of 18 independent experts that monitors the implementation of Convention on the Rights of the Child by its States parties. Ghana ratified the Convention in 1990.